Everyone’s favorite holiday tradition is just around the corner — The Nutcracker. Indiana Ballet Theatre (IBT) will be performing its 21st annual performance throughout Northwest Indiana this year. Composed in 1892 by treasured composer Peter IIyich Tchaikovky’s, The Nutcracker is one of the most memorable ballet classics. The colors and classical ballet dances are simply breathtaking. Experience the immense wonder of a child as young Clara’s world transforms into a fantastical land of snow, Land of Sweets, and adventure. Follow Clara through her journey as she and her beloved Nutcracker encounter the Mouse King and his soldiers, and are entertained by dancers from various countries. We invite you and your family to immerse yourselves in the magical sceneries and timeless holiday story. Under the direction of Founding Artistic Director, Gloria Tuohy and Associate Artistic Director, Amanda Tuohy. Ranging in ages from 4 to 74, watch in awe as casts of more than 100 take to the stage and bring this classic to life. 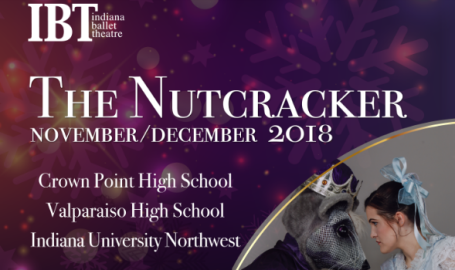 Share the memorable tradition with family and friends this season with tickets to this year’s performance located in three convenient locations throughout the region – Crown Point High in Crown Point IN, Valparaiso High in Valparaiso, IN, and Indiana University Northwest in Gary, IN.